Moodbidri, Aug 4, 2014: Moodbidri Police have on August 3, Sunday arrested the prime accused in the case of theft of peeled arecanut worth Rs 90,000 and electronic goods worth Rs 17000 belonging to Vincent D’Mello of Palkedabailu in Daragudde village recently. The arrested person is Sukhesh Poojari (24) of Marodi in Belthangady. He is a a painter by profession and was arrested near Handelu Cross. 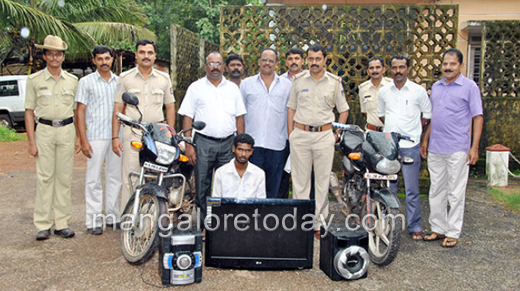 A TV, DVD player and Discovery bike has been seized from him. Police have already arrested Dineh Poojari (28) and Harish Poojary (26), also painters, in connection with the case. They had stolen the arecanut bags as well as the electronic gods from Vincent D’Mello’s brother’s house. The arrest was made by a police team lead by Moodbidri Inspector Anantha Padmanabha.